The resort town of Cabo San Lucas, named for the slender cape extending eastward from Baja's southernmost tip, gradually developed into a tourist hot spot the last forty years. During the Spanish colonial era, its natural harbor was periodically used by passing mariners, but since it offered no source of fresh water and scant protection during the late summer storm season when chubascos rolled in from the southeast, it was largely ignored by the Spanish. Although English pirates used the harbor as a hiding place for attacks on Manila galleons, many of the historical incidents ascribed to Cabo San Lucas may have actually occurred near present day San Jose del Cabo, where ships often watered at the Rio San Jose estuary. By the 1930s, a small fishing village and cannery occupied the north end of the Cabo San Lucas harbor, inhabited by approximately 400 hardy souls. The cape region experienced a sportfishing craze in the 1950s and 60s and due to the prolific billfishing, the waters off the peninsula's southern tip earned the nickname "Marlin Alley". Fly in anglers and wealthy pleasure boaters brought back with them glorious stories of this wild place which fueled population growth to around 1,500 by the time the Transpeninsular Highway was completed in 1973. 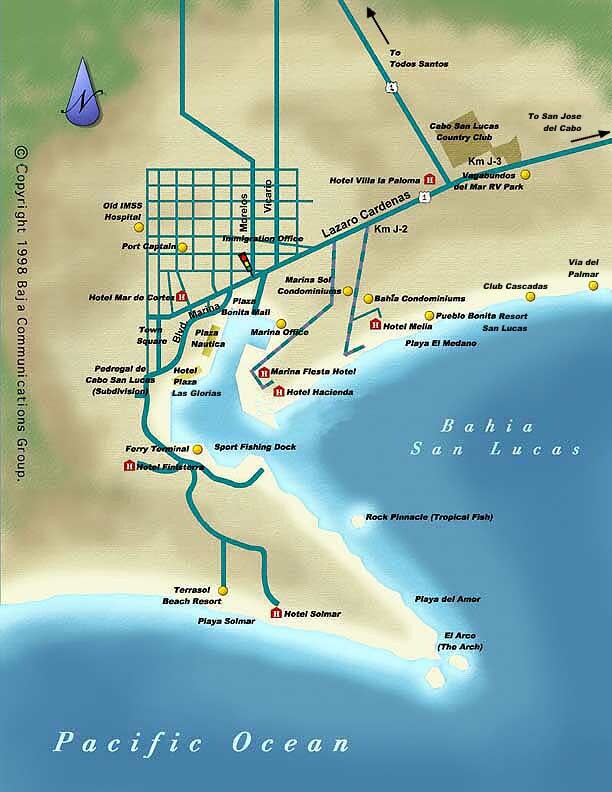 Following the establishment of the paved highway link between North America and Cabo San Lucas, the town transformed from a fly-in/sail-in resort into an automobile and RV destination. The construction of Los Cabos International Airport near San Jose del Cabo in the '80s brought the area within reach of vacationers who did not have time for the six day drive from the border to the Cape and back. The establishment of a water pipeline between San Jose and San Lucas further loosened the limits on development. Los Cabos, as the area became known, stretched from Cabo San Lucas through the Resort Corridor 20 miles to the northeast to San Jose del Cabo. Today, Los Cabos is booming and is currently the the seventh most popular tourist destination in Mexico and the second fastest growing resort community in the country. With a permanent population of only 40,000, many of them retirees, the tourist to resident ratio is quite high, especially during the peak Nov-Feb tourist season. San Jose del Cabo and Cabo San Lucas enjoy equal access to the great beaches along the corridor between the two towns, but because the Cabo San Lucas harbor provides shelter for a large sportfishing and recreational fleet, the majority of the Los Cabos visitors center themselves in Cabo San Lucas and the Resort Corridor rather than in San Jose del Cabo. In spite of all the tourists, Cabo manages to retain something of a small town feel. Besides the full service marina, Cabo San Lucas's main attractions include an underwater nature preserve only a few minutes' boat ride from the harbor and the striking Land's End rock formations at one end of the bay, with a pristine beach right around the corner. Without the tenacity of a few of the town's original residents who demanded that this land be preserved, hotels and condos would probably fill the town's entire perimeter. 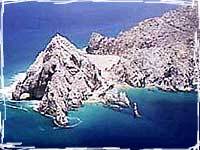 Cabo San Lucas is the only coastal resort in Mexico with a nature preserve within its city limits. Outside this area however, hotel, condo and golf development marches ahead. Pedregal, a fashionable hillside district to the west, the marina, and Playa El Medano to the east are all chockablock with condos and villas. Next to undergo development will probably be the large section of unused harbor front property near the inner harbor entrance, where the old cannery and ferry pier sit abandoned. Rumor has it that this will become a new docking area for cruise ships; By 1993, five cruise lines: Princess, Carnival, Royal Cruise, Bermuda Star and Seaborn, featured Cabo San Lucas on their itineraries. While Cabo nightlife is not on par with Acapulco's, the town attracts a young, energetic crowd that creates a more vibrant ambiance than is found at the relatively laid back city of San Jose to the north. All in all, Los Cabos offers something for everyone in a natural wonderland where the desert collides with the confluence of the Pacific Ocean and the Sea of Cortez.